SYNOPSIS: A scientist is able to create life using a DNA sample from a meteor. Bad guy John Ireland finds out and steals the alien fetus for his evil plans. Nosey reporter David Warbeck is following the story with the help of a woman, Laura Trotter, who has a psychic connection to the growing alien. For a local reporter Warbeck is pretty capable. He has a shoot-out with a helicopter, (literally) drives an airboat at top speed through the glades and still finds time to bang a full frontal Trotter! Very low budget, and cheesy, Sci-Fi action from aging director Alberto De Martino. 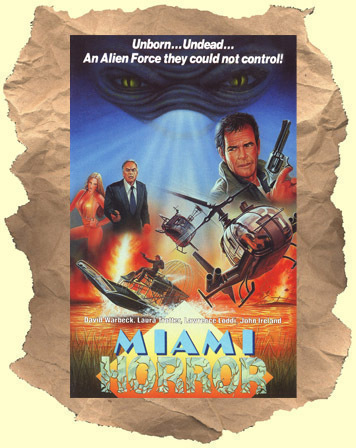 Lot's of Miami locales, an opening theme that steals from Beverly Hills Cop and bad 80's fashion. A disjointed but entertaining exploitation romp.